Welcome to the very first Fanfic Friday on Drink Read Love. 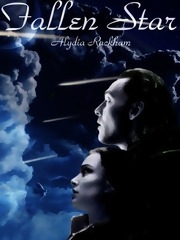 Today we're going to look at Alydia Rackham's Lokane fic Fallen Star. I'm so excited for this feature. It won't be an every week thing, but I hope to do it at least once a month, maybe more if there are things like movie openings, shows starting back up after breaks, that type of thing. It seemed appropriate to have the first Fanfic Friday be a fic by Alydia Rackham since this week's book review was on her novel The Paradox Initiative. In the Author Q&A on Wednesday, she answered a few questions about her fanfiction writing process, her role in starting the Lokane fandom (more on that in a minute), and specifically on a series she did called The Lokistone Universe. The biggest reason I wanted to do Fanfic Friday this week is because - aside from the fact that her fanfics are sell-in-a-bookstore-in-hardcopy-format quality, fanfic is how I was first introduced to the world of Alydia Rackham's writings. Her fics drew me in and eventually, I went looking at her original novels on Amazon and voila. New favorite author all around. It all started a few years ago when I had watched some Marvel movies. I, being a sucker for romance, was looking for anything I could find about Thor and Jane Foster. I think I had recently-ish been introduced to fanfiction in general and went searching to see if there was anything about Thor/Jane. Somehow, I came across Fallen Star and another Lokane fic by a different author and a new love affair was born. Quick note: Lokane refers to the shipping of Loki and Jane Foster. I will admit, I was skeptical at first. Thor and Jane made such a cute couple and Loki was such a jerk in Thor and in The Avengers, I just couldn't understand why on earth Lokane was a Thing. But then... oh, then. I read, and I was a convert. I realized that Loki and Jane were a much better match, and that Loki was more complicated than being a simple cookie cutter villain, and that in so may ways, it Made Sense. Ever sense, I've been scouring the web for good (key word, there, GOOD) Lokane fics. The Thor movies aren't quite the same since. I still love them, don't get me wrong, but I would love to see them take it a different direction and pair Loki/Jane and Thor/Sif. I think those pairings are far better suited to each other than Thor/Jane. "All Loki wants is revenge-the Cube may be his key. But when he hides his identity to get info from Jane Foster, something inside him shifts. And when the Cube is stolen, Loki must choose between vengeance, and the woman he fears he can never have." Fallen Star takes place immediately following the end of the movie Thor, immediately after Loki has fallen from the Rainbow Bridge in Asgard. When Loki fell, he landed on Earth close to the place where Thor landed when Odin exiled him. Jane and Darcy see this on the instruments in Jane's lab and, thinking that Thor has returned, rush out to the site. Loki recognizes Jane but she doesn't recognize him, and this is when he gives a fake name to Jane, introducing himself as an Asgardian guard named Fenris. I don't really know how to further sum it up beyond the blurb from the website, besides to say there's magic, action, adventure, romance, and lots of emotions. If you're looking for good Avengers related fics, I highly recommend Fallen Star. It's novel quality writing, and it's long enough to be a novel, too. Rackham does a fantastic job keeping her characters true to the MCU films, which can be a rare thing. Even their conversation flows naturally and keeps to their patterns of speech. Additionally, you have Rackham's talent of painting vivid pictures with words, allowing you to be fully immersed in what you're reading, as though you were watching a(nother) movie. The story progression makes sense and blends seamlessly with the movie. Another plus (for me) is that the story doesn't end with the last chapter of Fallen Star. Rackham has created a whole universe of Lokane stories known as the Lokistone universe. There are short and long sequels to Fallen Star and other fics which take place in the same universe but alternate realities, all connected. That gets explained early on in a later fic, The Lokistone (but I recommend starting with Fallen Star and working your way through that entire series before going on). Please do check out Fallen Star and then look at her other stuff on Fanfiction.net. She has fics in many other fandoms outside of Lokane and outside of the MCU. And of course, check out her original novels on Amazon and her latest work on Patreon. On to the drinks... with Fallen Star, I drank Celestial Seasonings Classic Sleepytime Tea. It paired nicely as far as taste and atmosphere, as well as going beautifully with the tea-drinking that occurs in the story. I do love a good chamomile tea, and Sleepytime is my favorite so far. Have you read any of her fics or novels? Any other good Lokane fics you can recommend?